Here we are in June and it feels like the hard slog of getting the garden up and running is over. With most of the summer crops planted now and the edible landscape project well under way I'm feeling good about the progress being made. Now comes watering and weeding and the monitoring for pests as well as increased harvests and planning how to preserve the fruits of my labors. I always feel like the summer garden has begun when I plant the squashes - both summer and winter varieties and that is what I did this weekend, placing all of them under protective row covers to fend off the truly disgusting vine borer. I'm succession planting radishes, lettuce, beets and scallions. This is my first year growing leeks and they seem to have adjusted OK to being transplanted outside, even if they seem a little skinny! The cabbages are forming heads, at least the ones that haven't been chewed beyond recognition by the slugs. Mint and rosemary are thriving in their pots. This week I planted cilantro, parsley and basil to go with the volunteer dill that has moved into every bed! Pea pods are appearing on the vine. I picked and ate the first one yesterday and it was so sweet and crunchy. I may have enough for a stir fry in a few days. The big news this week are the blooms. Flowering for the first time this week were marigolds, chives, lavender, blackberries and tomatoes. Small dots of color brightening up the gardens - little promises of delights to come. 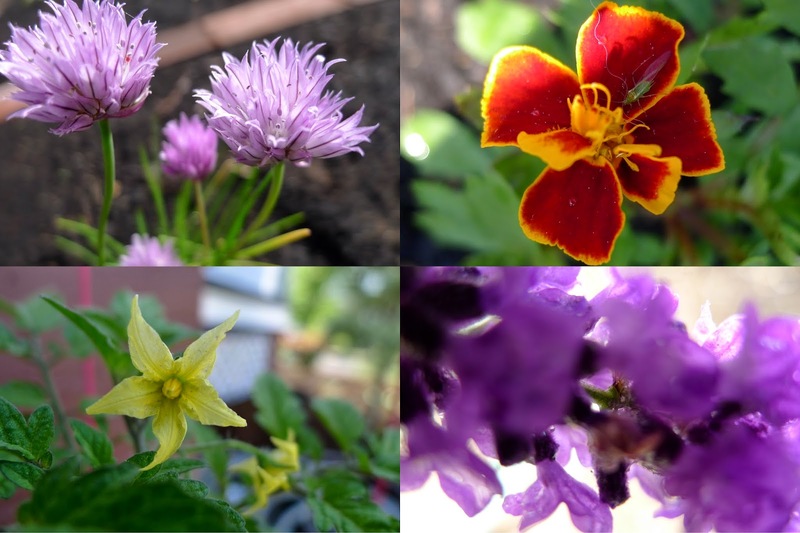 What's new in your garden beds this week?